Medical space planning, healing environments research, technology and savvy interior architecture all coalesce in an employee health and wellness center on the Cisco campus. This pilot project embraces innovation starting with the space planning of the care suite. Patients begin their experience in a relaxed living room setting where vital signs are captured and a discussion between the physician and patient occurs while seated in lounge chairs in front of a large monitor. Afterwards, the patient changes into a linen gown and bathrobe in a private bathroom/dressing room adjacent to the examination room. Family who accompany the patient may remain in the living room to watch educational health-care related programs or, in the case of children, cartoons. 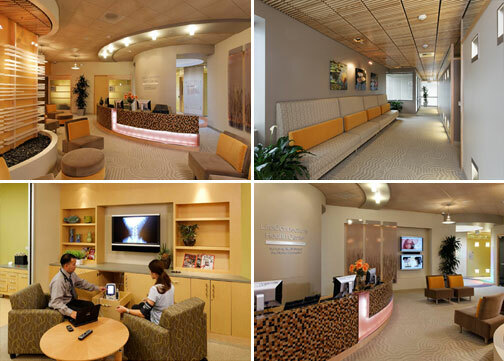 The focus on holistic wellness generated a healthcare design concept that was relevant both thematically and as an organizational component of the space plan. Four rotundas or nodes, each with a large light well/skylight to draw light into the core of the medical clinic express the body, heart, mind, or spirit—principal constructs of holistic healing. Another feature of the space plan is the ability of caregivers to circulate within and access care suites from “off-stage” corridors. This provides more privacy for staff and prevents patients from overhearing conversations. In turn, patient privacy and dignity are paramount in this medical clinic design which employs all possible measures to assure acoustic integrity.